Parties MUST be booked at least ONE WEEK in advance AND place a NON-Refundable $200 deposit down at time of booking. Parties are available to Book 7 DAYS A WEEK!! Phone calls to Reserve Parties are taken Monday-Friday ONLY, not Saturday or Sunday. NO EXCEPTIONS. We DO NOT HOLD Birthday dates or times without a $200 deposit/reservation. The deposit is NON-REFUNDABLE; however, we will reschedule your event within 90 days from your original date. (Credit card charged must be presented at desk prior to event). Cake is the ONLY outside food that is permitted inside the park and it is ONLY ALLOWED with a SCHEDULED event or party. NO OTHER FOOD OR DRINK IS ALLOWED IN THE PARK. If you opt to provide your own birthday cake instead of purchasing our cake, you must provide your own candles. We DO NOT allow BALLOONS, CONFETTI, OR PIÑATAs. We only offer scheduled events and parties and DO NOT OFFER ROOM RENTALS. Mini Golf is not available as an attraction choice in the Birthday packages, but you have the choice of the Moonwalk Gravity Party. In order to respect ALL GUESTS, Galaxy must stick to a set schedule. We absolutely DO NOT HOLD Party Schedule for LATE GUESTS OR BIRTHDAY CHILD. Call 919-584-4000 Ext. 105 To Book Today! 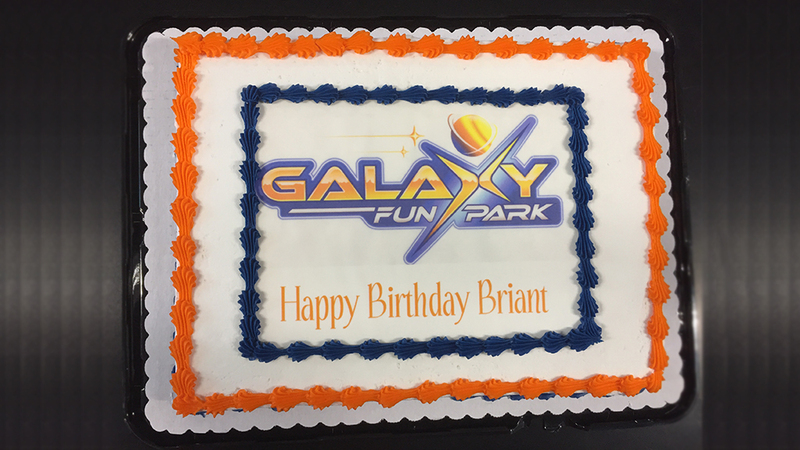 Don't wait too long to book your Out of This World Birthday Party! Slots fill fast and need to be booked at least two weeks in advance. Guests MUST be 54" or less for this party. NO EXCEPTIONS. Recommended for ages 7 and below. *"No outside food or cake allowed with this package." *In the event of inclement weather we do not offer refunds of deposits. We will rebook your birthday party no later than 30 days from your original date and move your deposit to that date. Prices are for Parties booked on Fri, Sat, and Sun. There will be a $50 discount for parties held M-Th. ROPES COURSE- must be 48"
SPIN ZONE BUMPER CARS- must be 5 yrs old and 38"
LASER TAG-must be 5 yrs old and 40"
SOFT PLAY- must be under 54"